I’ve only just started this blog but I’m already finding it a welcome refuge from other areas of the Internet. I mean, why would I want to debate on Twitter about the merits of the junior doctors’ contract when I can write about cooking an omelette and spend a few minutes deciding how to arrange my photos of same? I don’t support the strike but it seems that explaining how hard doctors work, how much pressure they’re under and how much family life they miss out on just doesn’t wash with some people so today, omelettes it is. Since my mother-in-law came to live with us when we moved to Bristol in 1997 it has become a tradition to have Sunday lunch together. She has her own flat complete with kitchen and is independent but coming together for this meal punctuates the week very nicely and I’m sure has enhanced the relationship between grandmother and grandsons. Depending on what everyone’s doing during the day, it sometimes has to be supper, but this joint meal is rarely abandoned, even now that there’s often only one grandson present. Granny tends to make the pudding and do the vegetables (and insists on this despite being 90 and somewhat frail) while I do the meat (usually a roast but not always) and potatoes. If we eat at lunchtime, we tend only to have something light in the evening and this often involves eggs. Sometimes it will be a nursery tea of boiled egg and toast (soldiers when the boys were young). This week we decided to have omelettes, upon which my husband, grabbing my iPad, excitedly announced he’d take photographs so that I could blog about it. 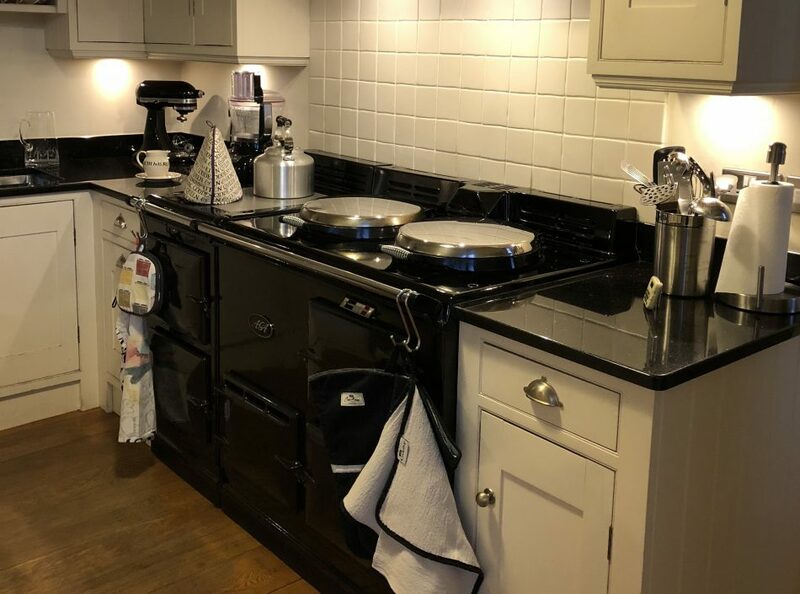 I’ll be honest with you, I was sceptical; there’s little difference between making an omelette on an Aga and in a conventional oven and I did not think it would make for an interesting blog post, but he took the photos and was enthusiastic so how could I deny him? The method I’ve found works best is to start it off on the simmering plate and then, having pulled in the edges a little after a few seconds’ cooking, to transfer it to the roasting oven for a minute until there’s no liquid left but it’s not, heaven forbid, overcooked. Drizzle on some chilli oil (optional) et voilà! Son4 made his with chopped red chilli and I made the husband’s, while he took pics, with fines herbes (parsley and chives in this case). A little chilli oil was drizzled onto both.